202 pages | 9 B/W Illus. 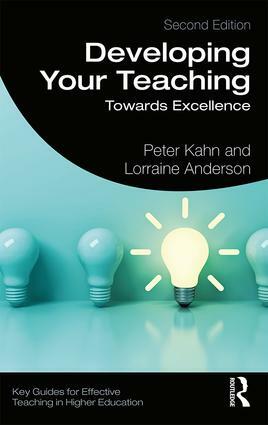 A must-read for all those new to teaching in higher education, as well as more experienced lecturers looking to refresh and advance the quality of their teaching, this fully updated new edition is the ideal toolkit to support the development of teaching practice. Peter Kahn is the Director of the Centre for Higher Education Studies at the University of Liverpool, UK. Lorraine Anderson is an Assistant Director of Student Services and Head of the Academic Skills Centre at the University of Dundee, UK. This indispensable series is aimed at new lecturers, postgraduate students who have teaching time, Graduate Teaching Assistants, part-time tutors and demonstrators, as well as experienced teaching staff who may feel it’s time to review their skills in teaching and learning. provide links and references to other work on the topic and research evidence where appropriate. Titles in the series will prove invaluable whether they are used for self-study, as reference material when seeking teaching recognition or as part of a formal taught programme on teaching and learning in higher education (HE), and will also be of relevance to teaching staff working in further education (FE) settings.